What Happens Next in the Map Update Process? After the release of a preliminary Flood Insurance Rate Map (FIRM), there are certain steps that must happen before it can become a community’s official FIRM. The FIRM adoption process requires a 90-day appeal period in order to ensure for local input. During the appeal period, community officials and the public can submit scientific or technical information to FEMA if they believe the preliminary FIRM should be revised. Below are the next steps in the process to be completed before the preliminary FIRMs become final. FEMA reviews appeals and comments submitted by community officials and the public during the 90-day appeal period to determine any changes warranted to the preliminary FIRMs. If needed, FEMA will issue revised preliminary FIRMs that incorporate such changes. All feedback submitted during the 90-day appeal period must be resolved before the preliminary FIRMs can move to the next phase. After all appeals have been resolved, FEMA will finalize the maps. A Letter of Final Determination sent to community officials starts a 6-month period during which the community must adopt the new FIRM. The FIRM will then become effective and serve as the basis for flood insurance rates and purchase requirements, and local building regulations. Learn more about this process in FEMA’s publication, Adoption of Flood Insurance Rate Maps by Participating Communities. FEMA uses the Revalidation Letter process to keep Letters of Map Change (LOMCs) issued for the previous FIRM in force, if warranted. Revalidation Letters are sent to community officials and are effective the day after the new FIRM. The letter will list all existing LOMCs for properties in your community that are confirmed to still be located outside of the Special Flood Hazard Area on the new maps. Community officials can submit information to FEMA to support a map revision to an effective FIRM (not a preliminary FIRM) at any point in time. These requests are often handled through the Letter of Map Revision (LOMR) process, a quicker and cost effective way to update a FIRM. To help communities compile the data required for such a request, FEMA has developed step-by-step instructions and forms available on the FEMA website. These forms can also be used to request a Conditional Letter of Map Revision, through which FEMA provides comments on a proposed project that would, upon construction, affect flood hazards in a community. 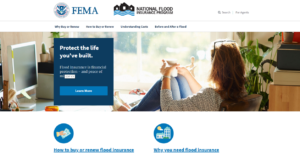 If you or your residents have questions about flood maps, flood insurance and/or claims, you can use the resources below to speak with a FEMA representative directly. Visit the Contacts page for a full list of topics and resources.